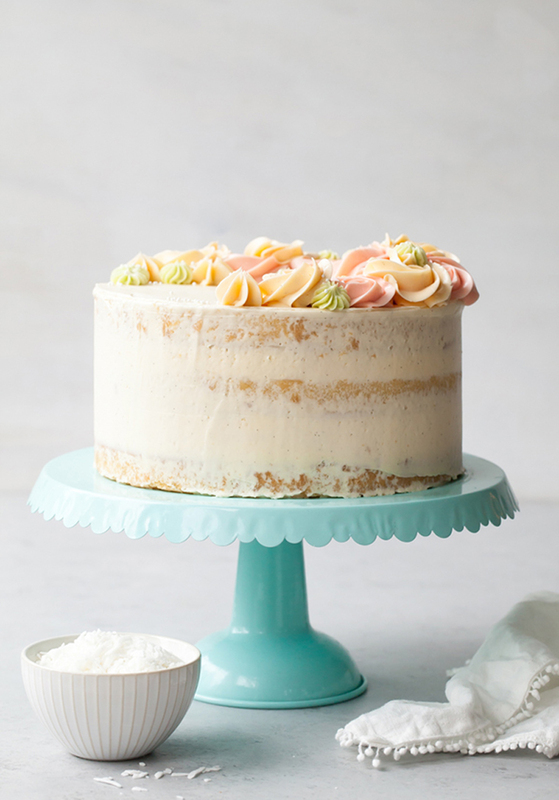 Coconut Cake – homemade coconut cake with creamy coconut milk, brushed with coconut syrup to keep it extra moist, and topped with vanilla bean buttercream frosting. In the bowl of an electric mixer, beat the butter on medium speed until smooth. Add in the sugar and continue to mix until light and fluffy – 3 to 5 minutes. With the mixer on medium-low, add in the eggs, one at a time. Add in the vanilla extract. Stop the mixer and scrap down the bowl. With the mixer on low, carefully add in half of the dry ingredients. Once incorporated, slowly stream in the coconut milk. Add in the remaining dry ingredients. Once incorporated, mix the batter on medium speed for no more than about 30 seconds. Evenly divide the batter into the three prepared pans. Bake for 22 to 25 minutes, or until a toothpick inserted into the center of the cakes comes out clean. Cool on a wire rack for 10 to 20 minutes before removing the cakes from their pans. While the cakes are still warm, brush them with the coconut simple syrup. While the cakes are in the oven, start your simple syrup. Both the cakes and syrup should be slightly warm, so it is best to start making the syrup once the cakes go into the oven. Place the coconut milk solids, water, and sugar in small saucepan. Heat the mixture oven medium-high heat until everything melts together and the syrup begins to simmer. Reduce the heat to low and stir in the shredded coconut. Simmer for about 10 minutes then remove from heat. Once the cakes have been removed from their pans, strain out the shredded coconut and generously brush the warm syrup over the tops of the cakes. Allow the syrup to sink into the cakes (about 20 minutes) before being wrapped plastic and chilled. Slightly chill the cakes in the refrigerator for easier assembly or store overnight. Add the vanilla extract and vanilla bean seeds. Whip on medium-high until silky and smooth, about 3 to 5 minutes. The buttercream may look like it’s broken at some point. Keep mixing until it is completely smooth. 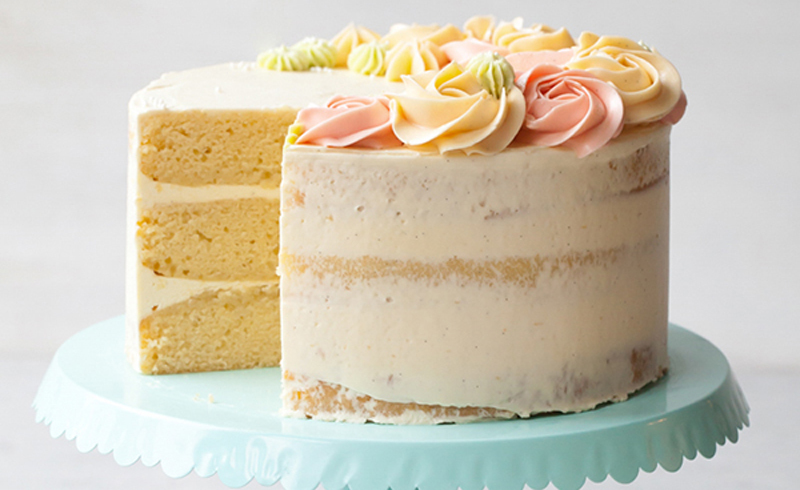 Place one layer of cake onto serving plate or cake stand and top with roughly ½ cup of vanilla buttercream. Repeat with second cake layer, more frosting and then last layer of cake. Lightly coat cake with a thin layer of frosting, letting some of the cake layers show through. Pipe pink and peach buttercream rosette using a 1M piping tip, creating a crescent shape around the top of the cake. Overlap a few to create some dimension. Fill in the gaps, by piping buttercream star buttons/kisses using both the 1M piping tip and 4B piping tip in peach and pale green. Finish with white nonpareils as desired. Most cans of full-fat coconut milk with separate into watery milk and solids. Save ¼ cup of the solid coconut milk for the coconut simple syrup. Be sure to thoroughly mix together the 1 ½ cups coconut milk for the cake batter.